DCH Logistics Company Ltd. (DCH), a subsidiary of the public listed Dah Chong Hong Group, is a FMCG (Fast Moving Consumer Goods) market leaders in Hong Kong and the Mainland. It has 3 distribution centers, manages over 1.3 million sq. ft multi-temperature warehouses, handles more than 20,000 tonnes frozen and chilled storage capacity in Hong Kong. 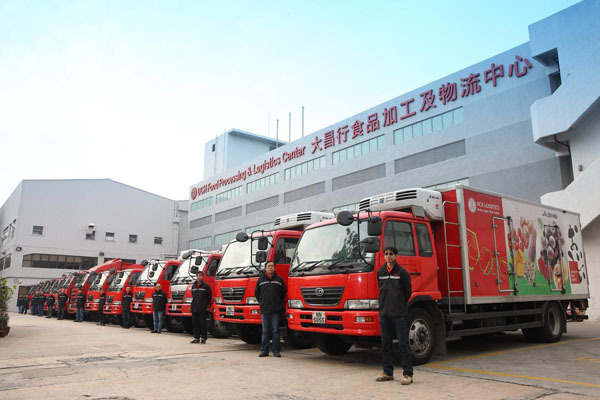 There is a fleet of 100-plus trucks, including those with freezers, for the delivery and distribution of food, imported fruits, vegetables and frozen meat to nearly 100 DCH Food Mart shops under the same Group and other food retailers on a 7×24 daily operation in local market. Fast-paced, short-lived perishable supplies require real time temperature / humidity control during the food supply chain process from farm to table. Traditional monitoring devices could not provide transparency and timely food quality management decisions. As a result, food deterioration which attributing over 20% of food wastage, has posed threats to the environment, food safety, public hygiene and consumer confidence. Extra cost, time and effort in handling the perishable items’ replacement and disposal have impaired the operational efficiency as well. Assisted by EBSL, DCH has come up with an intelligent solution. The company has applied an IoT Food Quality Management Service Platform to upgrade its cold chain management across the whole supply chain process. RFID sensors and other devices have been put in place to continuously monitor the storage and processing environment. This is a preventive control that records and monitors real time temperature / humidity variation to identify any deviation from predefined settings. The GPS tracking monitor the efficiency of trucks by tracing their locations and delivery time to check against any shift from pre-set routings during transportation. Notification alerts are automatically issued to operation teams whenever fluctuations in storage conditions are detected. Such critical real-time data allows timely remedial action to substantially minimize food wastage. The availability of comprehensive cold chain audit logs would facilitate management and control in making decision. Since the launch of the new IoT Food Quality Management Solution with the Location Tracking technology, DCH has achieved a productivity gain of 30%, operational efficiency enhancement of 25%, increase of customer satisfaction, and especially the ability to achieve return on investment (ROI) in a short time. Food security & food waste disposal are important Green issues nowadays. Saving food resources and energy, reducing carbon footprint, carbon emission and landfills are parts of corporate social responsibility (CSR) for the food business. DCH acts as a pioneer to use food quality management platform to serve as a reference model for the logistics and food industry. This application won the Best Green ICT Grand Award presented by the Hong Kong ICT Awards in 2014. The recognition successfully showcases the application of innovative information and communications technologies in solving the intricate problems faced by practitioners in the Food Supply Chain.